Job's wife responded to disaster the way many of us would. After all, she lost all her riches and all her children, too. Everything that was precious to her was taken at the same time it was taken from Job. This was her opportunity to shine, to show she was a faithful companion, a supportive spouse. It was an opportunity to show the greatness of her spirit. She failed. She could not look beyond her own pain and disillusionment. It was great to serve God and minister to her husband when everything was going well. Many Christians are not prepared for when trouble happens to good people. They have been fed the lie that if you come to Christ, He will solve all your problems and life will always be great. Peace and Prosperity forever. Like Job's wife, their life falls apart when disaster strikes. The reality of their heart is revealed as they abandon the faith and return to the world disgusted with the failure of Christianity. In truth, it wasn't Christianity that failed, but a false picture of Christianity that crumbled. Although it may not have appeared that way, ultimately they were self-focused. They were the centre of their world and Christianity was just a convenient lifestyle that they chose to better themselves. Job was different. He felt the pain and heartache no less than his wife [plus he had to endure her rejection at his lowest point]. But he was not the centre of his world; therefore, he could only be shaken if his centre was shaken. His centre was God. This was not a religion of convenience. It was not a faith of his fathers. It was not a goal to wealth and health. Job's commitment was to God. No trouble that happened to him could shake that. God was the one anchor of his life, the meaning behind everything. It is interesting that, although Satan was the immediate cause of all that happened to Job, Job never once looked at Satan or rebuked him. [I am not saying that rebuking Satan is wrong - Jesus rebuked him on occasion.] Job looked behind the curtain. He knew trouble could not happen to him unless it was allowed by God. Instead of accusing God out of his pain or ranting against the Almighty in his anger and confusion, he chose to accept what God had allowed. He did know why it happened. As the later chapters show, he was confused and hurt, but he did not give up on God. He had a vision that no matter what happened, God was in control. He knew that God had a purpose. He knew that in the garment God was weaving, sometimes dark threads are necessary. He was willing to accept whatever God sent His way - whether it was pleasant or unpleasant. What is our reaction like? 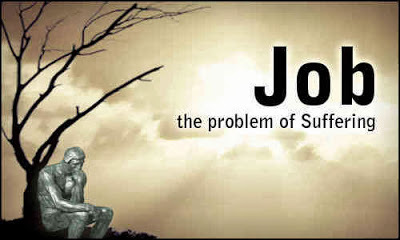 Are we like Job's wife, ready to blame God when things go wrong or disaster strikes? Or are we like Job, with a quiet confidence in our Almighty God even in times of confusion and pain? It really comes down to: Who is the centre of our world.